The OSD PAM-1270 is a major step forward in installation amplifiers technology. 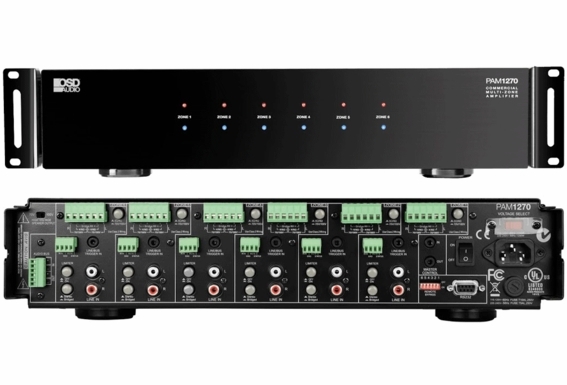 It features either Twelve Zone mono channels (70V) or Six Stereo Zones (8/4 Ohm) or a combination of both 70V and 8/4 Ohm 85% class D design technology, can operate as 6 independent Stereo Zone amplifiers. 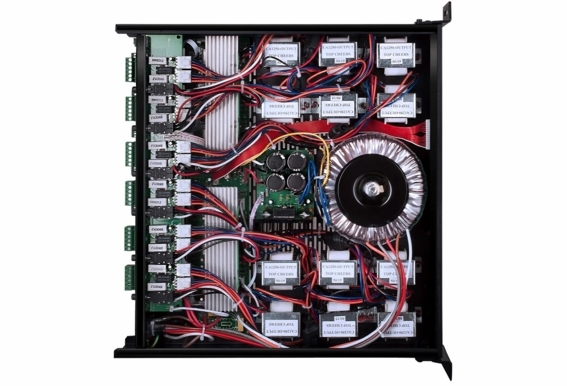 Self-explanatory Input and Output connections are easy to follow since any of the 12 mono amplifiers can be connected to either 70-Volt, 8-Ohm or 4-ohm speaker circuits. 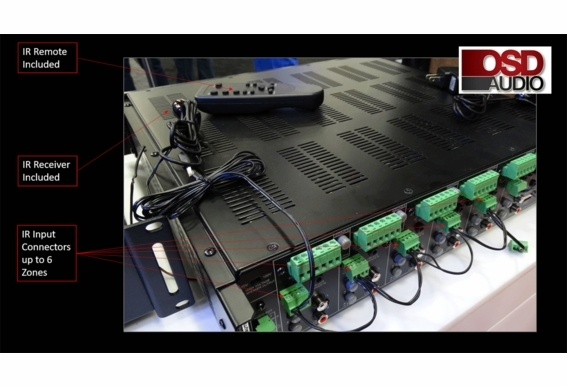 Each of the 12 mono amplifiers has their own input and output connectors and level Controls. 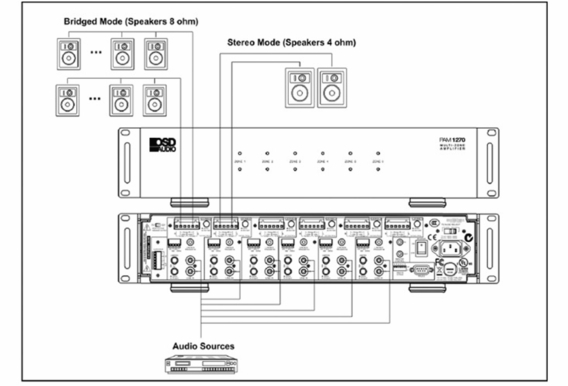 Up to 6 stereo Zones (4-ohm or 70-Volt at 50Watts/channel), 6 mono/bridged Zone amplifiers (110 Watt bridged 8-ohm). 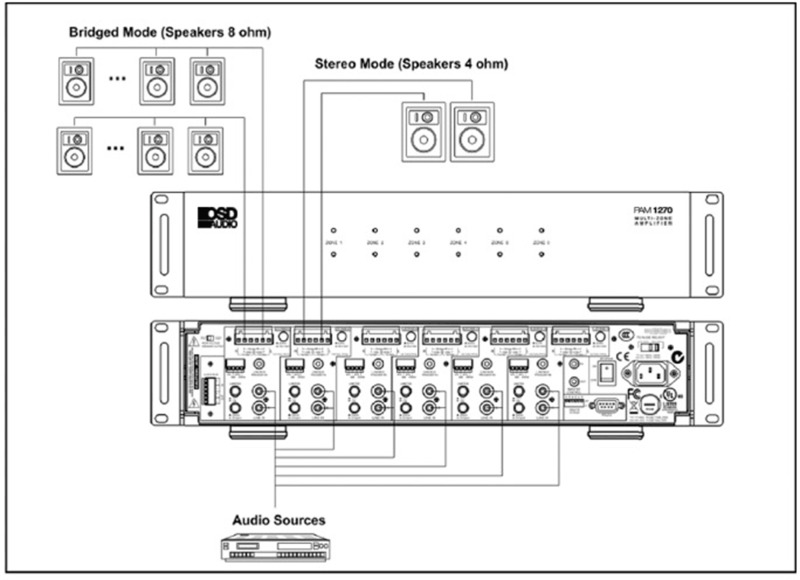 Each zone can be configured independently allowing a combination of Stereo 4-ohm or 70Volt and Mono/Bridged 8-ohm. 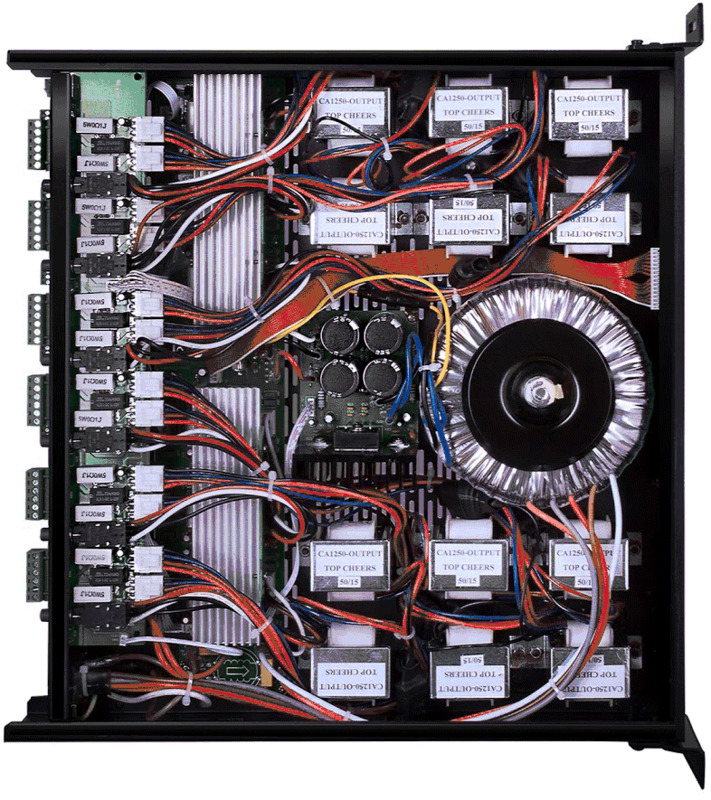 Dual-function LEDs on the front panel provide both activity and Clip indication for each pair of amplifiers. 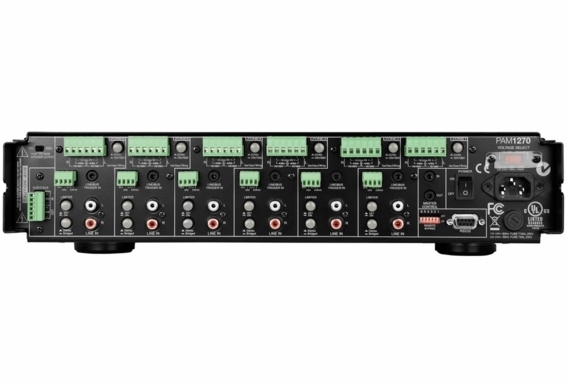 Additional features selectable on the back panel include Six Limiter Button and Six Stereo/Bridge modes for the individual Stereo or Bridged Mono Zones. The Channel Input Line/Bus switch selects between either the Bus Input (button depressed) or the individual Zone's Input signal. The PAM-1270 includes a RS232 for IP interface with Home Automation Systems Additional features include: any amplifier with no signal at its input is automatically shut off and the CA1250 is Multi Voltage; able to operate either on 110V-120V/60Hz or 220V-240V /50Hz AC mains. Dimensions (W x H x D): 16.7" x 4" x 14.25"
The PAM-1270 is convection cooled. That is, it depends on the natural free flow of air up through the slot perforations in the bottom plate, over the internal heat dissipating fins, then out the top cover, for adequate cooling. 2. The PAM-1270 is designed for mounting into standard 19" (483mm) racks or on flat horizontal surfaces. 3. If mounted in an equipment cabinet or other confining location, allow at least 2 inches of space above the top cover (see Fig. above). Be sure there are large openings in the shelf below the unit and in the cabinet to allow the entry of cool air and the escape of warm air. 4. If the cabinet contains other heat generating components or you are using several PAM-1270’s, you will have to pay even closer attention to adequate ventilation. 5. Do not hesitate to use fans (quiet, boxer type), if necessary, to ensure a constant flow of air through the CA1250's and the other heat generating components. 6. 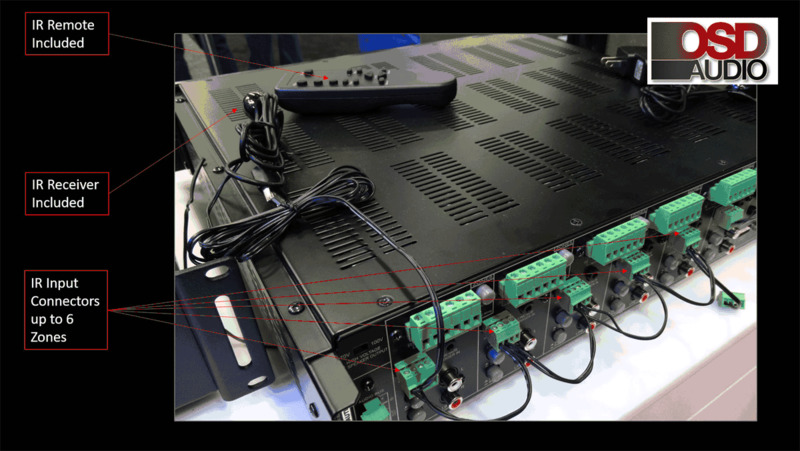 When installing the PAM-1270 in a rack, please use racks that feature rear support provision. Adding a single RU (Rack Unit) above and below the PAM-1270 will improve convection in heavy use applications. [One Rack Unit size = 1-3/4" (44.5mm) in height]. 7. In some installations, you may have large bundles of wire and cable to accommodate audio and speaker connections. Be sure to allow enough room for the leads and dress them in such a manner so as not to block airflow. Download PAM-1270 RS Commands and Queries Guide to program the Codes needed to connect to an RS232 Controller. Master Global Trigger In (+3 to +30V DC) and Trigger Out (+12V DC) for turn on of the PAM-1270 or external components equipped with 12 volt trigger. Plus individual Line/Bus Triggers input per Stereo Zone/Bridged Mono Zone. There are 12 zones in our home. A local company recommended 2 Sonance 1250 amps and 3 Sonos Connects. We have wall volume controls in 6 of the zones and were told we can still use them or opt to use Sonos wifi as well. 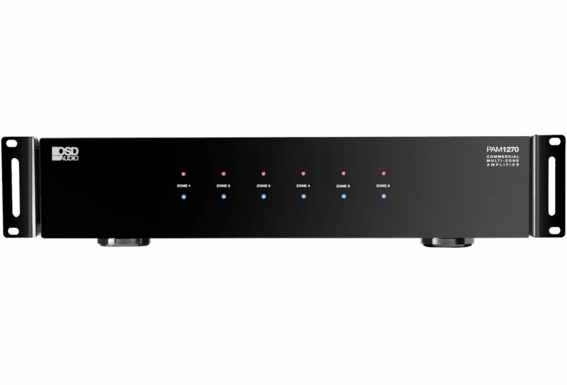 Does the 1270 offer identical power and features as the 1250 and will it work with the same with the 3 Sonos Connects? Also, does the 1270 offer features that the 1250 does not? Thanks. for the Pam 1270 12 zone amp is there a remote input selector switch available? using in hotel meeting rooms where amps in A/V room but can remotely combine speakers and change inputs remotely. thanks Matt O.
looking at this to run 70v , so it is simple to assume you have 12 outputs at 30w each with 12 mono inputs as well? I bought this item to conect to a Yamaha RX V679 receiver and to make 6 zones for my home. I want to be able to turn and off and to pop up and down the volume of each zone. I understand the IP Addressable RS232 will allow me to do this if I buy a serial controller and a license software to manage this (but his can be pricy just for pup and down volumen and swich off the zones). Anyone can recommend a cheaper solution?